If you ask my children who their favorite person in town is, they will answer Mr. Chi. And on many a night when I am running from field to field and juggling dinner in between, I would have to agree. Chi Shan Yang, known as Mr. Chi, is our local hot dog man and, like Santa Claus in December, he is seemingly everywhere. By day, he takes his cart to its permanent location in our downtown. By night and weekend he is on the move from each of our seven elementary, middle and high schools plus our three soccer fields to sell hotdogs. $4.75 and you have “the special” which includes two dogs, one soda or water and a bag of chips–a perfect nightcap to a baseball, basketball, soccer, lacrosse or football game. Originally from Taiwan, Mr. Chi came here to join his father and has now been running his own cart for 22 years. During that time he married, had three children and became a US citizen. His oldest is now in college. 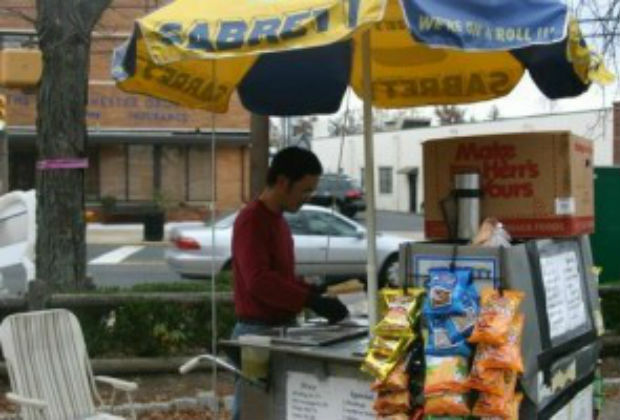 Owning and operating your own hot dog cart can be a low cost way to start your own business. According to Mr. Chi, basic costs include the cart (approximately $3,000) plus licenses and insurance which can run about $4,000 per year. Companies like Accion and Grameen provide microloans for small businesses like these. Mr. Chi’s sales can be as high as 2,000 hot dogs a month in the spring. Winter is a lot slower. Monday through Friday, his wife and sister in law operate carts in other downtown locations to help increase total revenues. Adding to his income, about a quarter of customers tip him—this runs higher during the holidays. Mr. Chi also knows the value of marketing. He believes the customer is always right, often allows children to pay him the next time and has been known to give my daughter free chips when she speaks to him in Mandarin, his native language. Asked if he would do it all over again, Mr. Chi smiled and said “yes” because he said, “you are making money and making people happy”, but you have to “work really hard” so that “people can find you without looking for you”. Are hot dogs in your future? Does your town have a Mr. Chi? Those of you who have already launched a small business like Mr. Chi’s, how did it work and what did you learn? Email me at annmarie@careerfuel.net to share your story!